We are a full service repair shop, specializing in component level repair. This means we offer services that most shops will not offer because of the difficulty level. A lot of Apple repair shops will repair computers by replacing entire assemblies. For example, if you have a cracked LCD panel and your MacBook but your glass and aluminum lid are fine, a lot of shops will replace the entire top screen assembly (lid, glass, isight camera, lcd, lvds cable, hinges, etc) rather than just replacing the bad LCD panel. We work hard to replace just the broken components, making our services noticeably less expensive than most shops. We got into the screen repair business when the White and Black MacBook were first released. Back in 2006 , Apple came out with the design featuring the white and black MacBook’s. 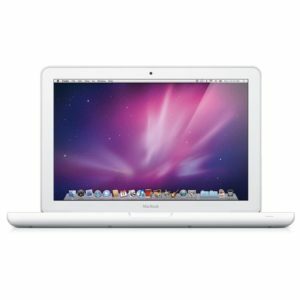 There were not a lot of shops that were offering LCD replacement on the MacBook computers for less than $350. We started offering the repair at $180 with our unparalleled 24 hour turnaround. Now there are a lot of shops offering repair services for cracked glass and broken LCDs on the MacBooks, but we continue to be one of the best quality repair shops in the nation. Over the years of offering this repair, we have found the best sources for replacement LCD’s, honed our techniques of removing the glass (when necessary) without causing damage to the rubber trim that surrounds the glass, and found the best adhesive for installing the new components. We know it is important for you to get your computer back ASAP. For that reason we offer 24 hour turnaround on our repairs. 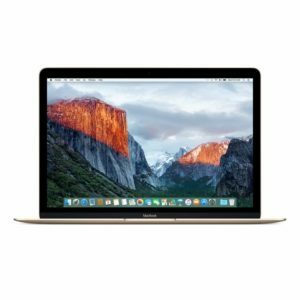 We will have the computer repaired and shipped back to you/ready for pickup within 1 day of receiving your MacBook for repair. 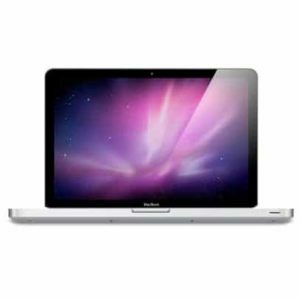 We offer replacement services for the entire line of Apple MacBooks including the 13 inch MacBook A1181, 13 inch silver MacBook A1278, and the 13 inch white Unibody MacBook A1342. No matter what is wrong with your MacBook screen, we can fix it! If you are unsure of the issue on your MacBook, please take a couple pictures showing the damage and email them to us. We will review them and get back to you with exactly what you need to get the computer repaired. 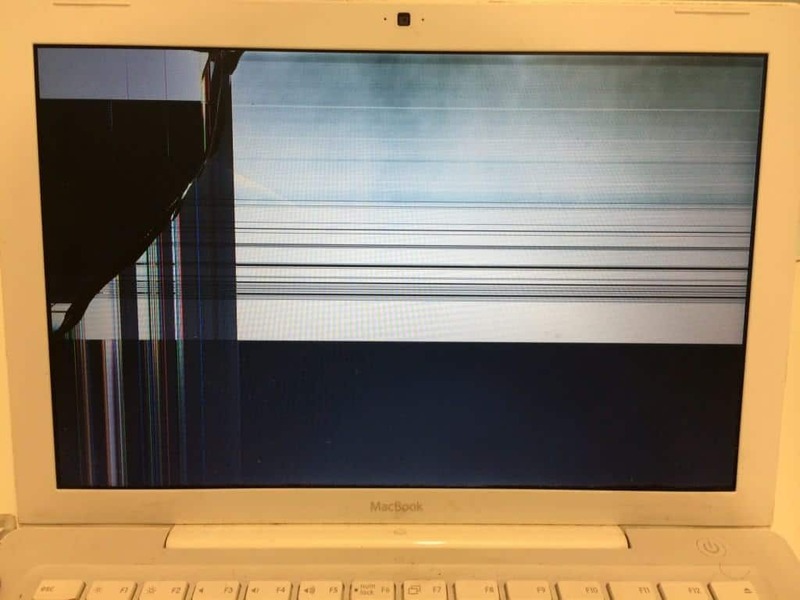 Does your MacBook have cracked or damaged LCD? Perhaps it took a hit from the back and now the image is distorted, maybe the screen is super dark because the backlight went out, or maybe there are some pesky lines in the screen. If the LCD is panel is the issue, we can get the computer back up and running with just an LCD replacement. You can see a couple examples of damaged LCD panels below. There was only one model MacBook that Apple made with a separate panel of glass covering the screen. The A1278 MacBook has a panel of glass covering the LCD panel that will sometimes get cracked, but the LCD panel will not be damaged. In this case you can still see everything on the screen with no distortion, but there will be cracks in the glass between you and the LCD. It looks like a cracked windshield of a car. 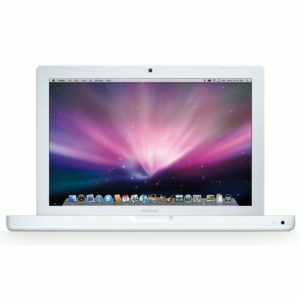 The cost to replace the glass on the 13″ A1278 MacBook is $175.